Just add items to your cart, and put in your country and state. Then select the correct Shipping Method button. (Please see the How To Order section for exact details). If you pick an incorrect method you will not receive the correct shipping cost and your order will be delayed. We have negotiated the best rates with UPS, FedEx and the most efficient trucking companies across the USA. Keep in mind that to ship a sheet of plastic, it must be properly packed and usually requires a pallet - whether we're shipping it across town or the country. We also can ship on Your Carrier account as an option - there's a button for that! Billing and Shipping Address: Remember that the Billing Address is where your card statement is mailed. Our AVS system will match that for your protection. We have been shipping orders placed online since 1995. Our site accepts these major Credit Cards: MasterCard, VISA, American Express. Please read our section on How to Order- which explains the Online Ordering process in detail. All standard stock items (not cut) are returnable for refund within 30 days of purchase. Items MUST be in "re-sellable" condition. Please call us or email at Orders@ePlastics.comfor a Return Authorization number with your Sales Order number. Item(s) will need to be returned to our factory prepaid where a full refund less shipping will be processed. Please note: Custom manufactured, items with logos, specials, close-outs, adhesives, resin products, patio table tops, cut-to-size, lemonade dispensers, and drinkware items are not returnable. Shipping Errors: Please call 1-800-542-6325 for Customer Service or email to Email us at Orders@ePlastics.comand reference your Sales Order Number NNN-SOnnnnnn. Due to the nature of our inventory and by offering custom cut-to-size material, our website does not specify if an item must be backordered or not. Although we make every attempt to notify our customers of backorders as soon as possible, sometimes it can take a couple days to find out that an item is out of stock or not available in the requested size. If we are out of an item at the time of order, we may either backorder items that are out of stock and ship any remaining items immediately, or if we expect delivery of the backordered item within approximately two (2) weeks then we typically try to ship your entire order together upon receipt of the backordered item. No additional shipping will be charged for shipping backordered items separately. Please let us know if you have specific backorder accommodations or if you need to cancel the backordered items to receive a refund at any time prior to the order being shipped. We stand behind all materials we sell. Clear Plexiglass acrylic sheet, regardless of brand we sell (all USA made), will not yellow from exposure to the sun. Some colors may fade over time (many years) from direct southern exposure. Polycarbonate will begin to haze in 5-7 years but will not lose strength or shatter - there are versions that will last longer in direct sunlight at additional costs. While we inspect all materials before shipping, there is always the very remote possibility of a "void" in the material that may not show up until you are machining a part from the material you purchased. Defective materials will be replaced and will be shipped to you at no cost upon our receipt of defective material. We cannot reimburse for any labor charges you might have incurred during the process. All information presented is from our 99+ years in plastics. We hope you find the information helpful in your search for answers. The express intention of Ridout Plastics is to help, not to prescribe a fitness for any particular use. As with all new applications, one must test the plastic for the application and make such judgements on their own. 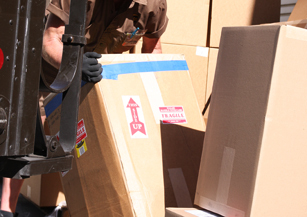 We use UPS and FedEx for all orders that qualify for small package delivery. The maximum weight per box is 70 lbs." Typically, orders are shipped in 2-3 business days, however cutting can add an extra business day. If there are any unusual delays you will be contacted by our customer service team. All remnants will be cut to fit within shipping method selected. If you have questions about an order you placed, please call, fax or email orders@eplastics.com - make sure and include the Sales Order number listed in your order confirmation email. Customers requesting replacement material for damaged goods received usually ships within 1-2 business days once all required information and pictures are provided. Customer requesting full refund for damage goods will not be given a refund until the damage claim is settled with the carrier. This process can take anywhere up to 90 days for the carrier to resolve the claim. ePlastics does not ship orders to PO Boxes. Ground Package - No Sheets: Basic choice for items that fit in a box, such as brochure holders, stemware, glues, accessories, thin film we can roll, and all rods and tubes no longer than 6 feet. All rods and tubes with lengths greater than 6 feet will require a shipping quote, so one will be emailed to you for approval after checkout. Choosing Ground ackage for sheet material will delay the order. Sheets up to 24x48: Choose this option for sheets no larger than 24"x48". These shipments include a lot of packaging to ensure safe delivery. Sheets up to 48x48 or 24x96: Choose this option for sheets no larger than 48"x48" or 24"x96"
Sheets up to 48x96: Choose this option for sheet sizes up to 48"x96", and also fiberglass purchases that are 26"x96". Sheets over 48x96: Extra large sheet sizes of 48"x120", 48"x144", 72"x96", 72"x120" and greater. Also fiberglass purchases that are 26"x144". This method requires additional packaging and special truck delivery. Depending on your facility, it could require liftgate, or White Glove delivery. Pickup in San Diego: Customers located in San Diego, CA are welcome to pick up at our will-call counter. If you do not reside in San Diego, please indicate your plans to visit the area in the comments box so that we can verify the pickup. We will contact you if there are questions regarding your arrival. Use My UPS/FedEx account: Want to ship on your UPS or FedEx account? No problem. Simply select the appropriate shipping method from the list based on your order size, and note your account information in the comments box during checkout. Once we verify your authorized shipping account, the shipping charges will be removed and we will email you a revised order to reflect the correct amount. There will be a small fee to package the shipment for safe transit. When shipping on your own account you assume all responsibility for the shipment including but not limiting to bearing the cost of freight/shipping charges, owning goods in transit and files any damage or loss claims (if any). Not sure which? No problem, we check every order. If there's a cheaper method than what you have selected, we'll change it. All shipments are delivered to the address, and will need to be unloaded from the truck. In some cases, liftgate, White Glove, and upper floor delivery may be necessary. Please call (1-800-474-3688) or email (orders@eplastics.com) us for details on this as the charges for these services are site-specific. Simply pick the shipping method that will accommodate your largest sheet. We have contracted UPS and FedEx for great ground rates across North America. Our LTL truckers each have a special part of the USA (including AK, HI and PR) that they cover and their efficiencies mean low shipping costs to you. Next day, 2-day, and 3-day shipping options are available (does not include glues and resins) if needed, simply select package type, add expedite request in the comments at final checkout and we will email you back with pricing. Canada shipments do not include broker or GST. We collect sales tax on pre-shipping totals for shipments to California and Texas addresses. A California Resale Certificate or Texas Resale Certificate form is required at the time of purchase. This is the obligation of each customer to notify ePlastics® at the time of purchase. We do not refund sales tax. If you do not submit your Sales Tax Exemption form in time, then you are allowed to file for a refund when preparing your monthly or quarterly BOE sales tax filing. Resellers must register an account at time of purchase and cannot checkout as a "Guest Shopper". Labor is taxable in California. Military and Government purchases may be exempt and tax will be removed prior to fulfillment if you note this in the comments sections of checkout. Alaska, Hawaii, Puerto Rico "Ground"
Canada: In addition to the posted charges, you MAY be assessed local customs and duty or GST taxes. Overnight Shipping: Please leave a note on the order comments during checkout. We'll call you with the exact rate before charging your card or shipping the order. Your order will total w/o shipping - we'll confirm actual fees with you. International Shipments(Except Canada): Call for pricing. Please see the International Order page. Canada: approximately 3-8 days plus your delivery man will collect some duty or GST. You can easily track the status of your shipment from the Fulfillment Message emailed to you from our Shipping Service Center. This site automatically collects order information but we only use this information in the aggregate. We'll never misuse the information you provide us....it's yours - Private! When obtaining information from you, we adhere to a simple, common-sense principle: we only ask for the information we need to give you what you've asked for. We do not sell or trade this information with ANYONE. When you give us your email, address, phone, etc., it remains on our site for use only by us to contact YOU. We may email you from time to time - but it'll be meaningful or we won't bother you.